Brandy - Who Started It All! Hi. My name is Brandy Alexandra Bennett. Mom and Dad adopted me on November 24th, 2001. They researched what kind of dog was best for their lifestyle and decided on the fabulous breed, Toy Fox Terrier (that’s me!) They knew how many homeless dogs there were in the world, so rather than buy a new one from a puppy store or a breeder; they went to the American Toy Fox Terrier Rescue website. Did you know that out of 49 recognized AKC breeds, 42 have rescue sites? And did you know that most dogs in shelters are purebreds? Dad likes to tease me and say that new, I would have cost them $1500 or more, but that used, I was free! They also say I am a priceless Princess. There is usually nothing wrong with the dogs that end up at shelters. Usually it’s a problem on the human end: a new baby, not enough research before getting a dog, a major life change, etc. In my case, I was well loved by my original family, but they had to enter housing that didn’t allow me to go with them. I ended up in a kill shelter in CT! I was terrified there, but luckily, a kind Veterinarian Technician who did small dog rescue, brought me home and posted me on the American TFT rescue site. (www.atftc.com/rescue) Because I was 7 years old at the time, I was considered a tough placement. What craziness, Mom and Dad say! Middle age and senior dogs are usually well trained, calmer and anxious to relocate to a loving home. Mom and Dad said that the day I came to live with them, we became a family. They couldn’t believe that not only did I have no “issues”, but that I came complete with circus tricks! We 3 were so happy as a family, that we wanted to help other pups and began to work with other small dogs that needed fostering along the way to their new homes. In fact, Mom became a dog trainer, so that she could help rescue and shelter dogs become more adoptable – she used to be the Tri-State rescue co-coordinator for ATFTC and still volunteers with both the ASPCA (www.aspca.org) and the Humane Society (www.HSUS.org), and primarily, now, with Shih Tzus & Furbabies Small Dog Rescue. On these pages, you’ll meet some of the friends I’ve helped Mom and Dad to train and socialize. I gotta tell you, I like having most of them here for awhile, and I know how important my job is, but I usually like having Mom and Dad back to myself once they find new homes. HOWEVER – I have recently made an exception and agreed to have a new little brother, Otie. He’s 2 years & 9 months old and a real cute tri-colored chihuahua. So now we are a family of four! You’ll get to read all about Otie’s journey on the following pages, and I’ll share with you some of the adventures I’ve had since I came to live with Mom and Dad. They are all the more amazing when you consider I could’ve been on death row (shudder)! 3 years ago today, our sweet Brandy made her transition to the Rainbow Bridge. She was 17.5 and lived a full and happy life, and started us on our “rescue journey”. Please consider adopting an “older” dog. 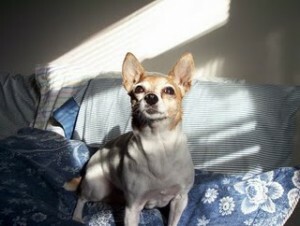 Brandy was 7 when she came to us and we had the honor of her presence for over 10 years. There are no guarentees in how long you will have someone’s physical presence when you choose to love, but choosing to love is always right. The pain will always be there when their body leaves, whether it’s 1 year or 20, so please, opt to adopt and consider a senior! Thank you Brandy, for teaching us so much, and for helping us to foster so many other dogs, for teaching them how to be good canine citizens, so they could find their “forever” families. All my dogs on YouTube!